More than a quarter of a million native English speakers are employed to teach English abroad every year. In many cases, those teaching English overseas will be hired locally and paid by the hour without major benefits like free housing and airfare. However there are some countries, including some of the largest job markets in the world for teaching English abroad, where it is common or even routine for schools to provide English teachers with free or reimbursed airfare. In such cases, schools will either provide new teachers with an airline ticket upfront, or they will reimburse the teachers for their airfare after they arrive and begin teaching. This is to ensure teachers receiving airfare actually show up for work; also some schools may require that new teachers pass through some sort of probationary period before receiving full benefits. In most cases, teachers will also receive airfare or a stipend for a flight home once their contract is over. If you leave early or break your contract, do not expect to receive your airfare home. 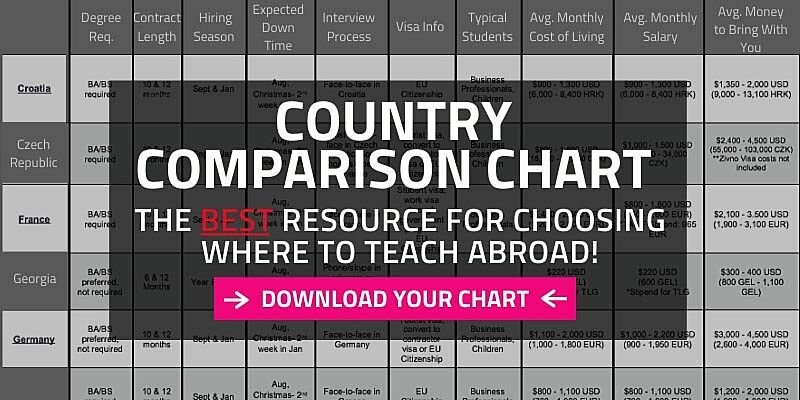 Click here to request a Country Chart that details salaries, hiring requirements, interview procedures and visa information for teaching English abroad in more than 50 countries around the world. China – More than 50,000 thousand foreigners are employed as English teachers in China each year and a high percentage receive free or reimbursed airfare. Most English teachers also usually receive free housing in China, or at least a stipend to cover housing costs and assistance in finding affordable housing. South Korea – Free or reimbursed airfare is the norm for some 25,000 Americans, Canadians and other English speakers who teach English in Korea. English teachers in Korea also typically receive free, furnished housing and make enough salary to save up to $1,000 or more each month after expenses. Persian Gulf Countries in the Middle East – Americans, Canadians and other foreigners who teach English in Saudi Arabia, Qatar, Bahrain, Oman, Kuwait and the United Arab Emirates (U.A.E., including Dubai and Abu Dhabi) will typically receive contracts that provide airfare to and from their home country. Asia: Hong Kong, Indonesia, Japan, Malaysia, and in some limited cases in other Asian nations as well. Europe: Russia, Turkey and the Republic of Georgia Ministry of Education program. Middle East & Former Soviet Republics: In rare cases in countries like Egypt, Iraq and Kazahkstan, English teachers may be provided with free airfare or a stipend. Central & South America: It is not common for schools in these countries to provide free airfare or stipends to foreign English teachers.